A wildlife community on cultivated land or on other land subject to significant human activity. A branch of veterinary medicine specializing in wild animals. An exceptional or excessive fright of all wild animals: As a result of her agrizoophobia, Nancy never wanted to go to the zoo with her parents, or even with the others in her class at school, because she was so apprehensive that one of the animals might attack and kill her. Desert agriculture which includes research in how to increase the agricultural productivity of lands dominated by lack of freshwater, an excessive abundance of heat and sunlight, and usually one or more of extreme winter cold periods, short rainy season, saline soil or water, strong dry winds, and poor soil structure. The use of geothermal heat in agriculture; that is, the use of low-temperature geothermal water to warm irrigation water or to sterilize soil. Omnium autem rerum, ex quibus aliquid acquiritur, nihil est agri cultura melius, nihil uberius, nihil dulcius, nihil homini libero dignius. Translation: "Of all the occupations in which gain is secured, none is better than agriculture, none more profitable, none more delightful, none more becoming to a freeman." This motto, written by Marcus Tullius Cicero (106-43 B.C. ), is also reproduced in a shorter version in the entrance foyer of the Museum of Hungarian Agriculture: Nihil melius nihil homine libero dignius, quam agricultura. 1. To travel from place to place, or from one country to another; especially, to go on foot in foreign countries. 2. To travel through a specific place. 1. To travel around in a location or from place to place; especially, by walking: Whenever Adam and his family went on trips, they peregrinated as much as possible in order to get a better view of where they were. 2. 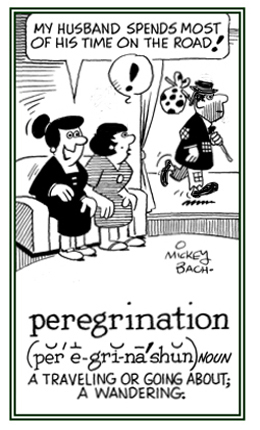 Etymology: from Latin peregrinus, "foreign"; from pereger, "traveling"; from per-, "through" + ager, "a field, land". © ALL rights are reserved. 1. A traveling from one place to another; especially, on foot: There are some people who love peregrinations and see the countryside close up rather than to go with vehicles. 2. 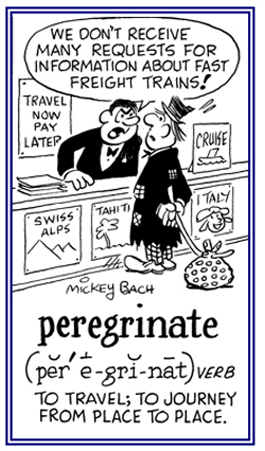 Etymology: from Latin peregrinatio, from peregrinari, "to stay" or "to travel", from per-, "through" + ager, "field, territory, land, country". © ALL rights are reserved. Digital memories will be able to record peoples' locations which can be logged at regular intervals, producing animated maps that trace their peregrinations. 1. 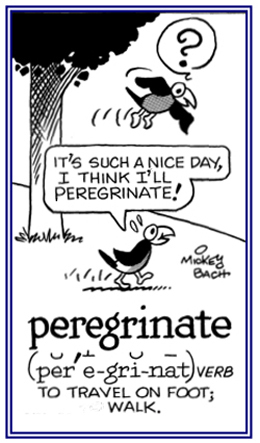 Someone who travels around for a long time or over a great distance: A peregrinator journeys or goes from place to place, as a wanderer or as a vagabond for months and months! 2. Travelers into foreign countries: In the summer, more people become peregrinators than during other times of the year. 3. 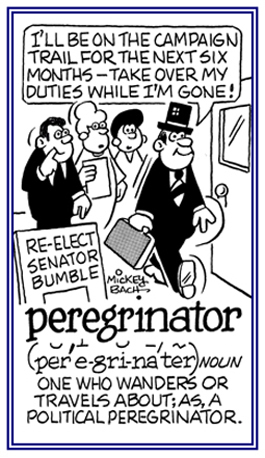 Etymology: from Latin peregrinus, "foreign parts, foreigner; traveling". © ALL rights are reserved. The Peregrine Falcon (Falco peregrinus), sometimes formerly known in North America as "Duck Hawk", is a medium-sized falcon about the size of a large crow. The English and scientific species names mean "wandering falcon", and refer to the fact that some populations are migratory. 1. Roving or wandering; migratory. 2. In biology, foreign, non-native; a reference to organisms transported into an area from outside that area. 3. Etymology: Latin, to travel about; foreign; abroad; that which is found "outside the Roman territory" (the ager Romanus), "field". Middle English, from Old French, from Medieval Latin peregrinus, "wandering, pilgrim", from Latin, "foreigner", from pereger, "being abroad"; from per-, "through" + ager, "land, fields". Cross references of word families related directly, or indirectly, to: "land, ground, fields, soil, dirt, mud, clay, earth (world)": agra-; agrest-; agro-; argill-; choro-; chthon-; epeiro-; geo-; glob-; lut-; myso-; pedo-; pel-; rhyp-; soil-; sord-; terr-.